In this post I’ll walk through rotating a bi-dimension matrix, in a functional way, by composing transpose and flip functions. We’ll assume the matrix to be square (n*n). We relied on a deepCopy helper to avoid side effects on the original Matrix. If you were seeking for a constant O(1) space complexity solution, scroll down for the in-place revised version. 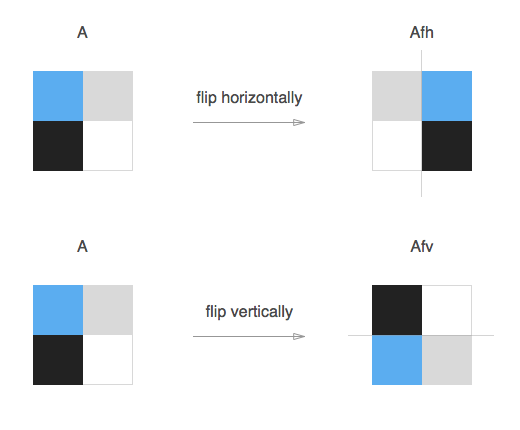 The horizontal flip of a matrix A is another matrix Afh created by reflecting A over its horizontal line of symmetry (which runs from mid-left to mid-right) to obtain Afh. While the vertical flip of a matrix A is another matrix Afv created by reflecting A over its vertical line of symmetry (which runs from mid-top to mid-bottom) to obtain Afv.